ON THE NEXT EPISODE OF DRAGON BALL Z! I vote for Uncle Donald. Next Smash Bros. Roster CONFIRMED! dolan and loland mcdonald r the best. 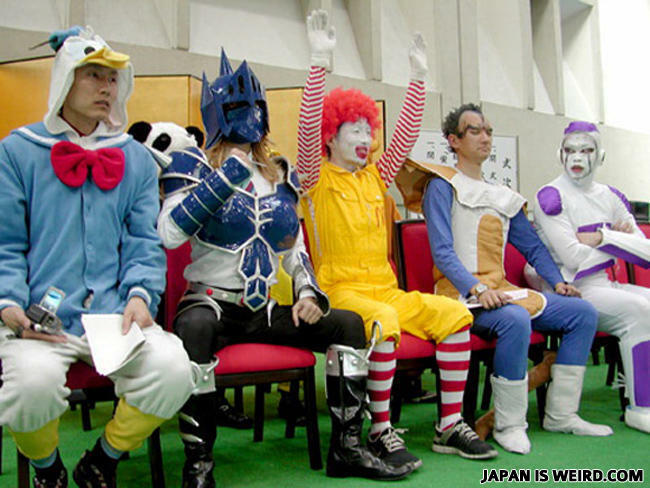 MEANWHILE, IN THE LEGION OF DOOM..
And the winner for the best cosplay is... RONALD MCDONALD!!! Hello. My name is Ronald, and I am an addict. I'm a clown. You're cartoons. Your arguement is invalid. 1. vageta has bigger hair 2. freeza only looks like a fail in his first form 3. Vote this up if you think dragonball z kai is one of the best anime shows to air in america 4. raditz's har compensates for somthing. he kinda looks like vegeta from GT but he's wearing his saiyan armor. is that death adder? from the golden axe games? sitting next to ronald? meanwhile at the legion of doom. Why couldn't the little boy skate? He had cancer. Do women shake the petrol pump after filling or is that just a guy thing?